Recently in North Dakota the John Wall New Voices Act was introduced, intending to protect high school and college student journalists with freedom of speech in content, particularly with school-sponsored media. North Dakota has become one of eight states that have or are starting to pass laws to protect those rights for student journalists. What does this signify to us as students at Mills College? Freedom of speech is one of the five rights in our First Amendment, going hand in hand with freedom of press, assembly, petition and religion. 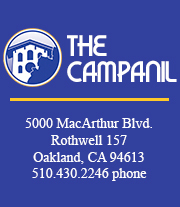 As a student newspaper, The Campanil knows all too well about the importance of the freedom of speech, particularly on college campuses. There have even been laws and precedents passed to protect those rights, such as California’s Leonard Law and the Hazelwood v. Kuhlmeier decision in 1988. As editors and journalists, we report and write to create an open dialogue of different perspectives for the Mills community. At the same time, The Campanil notices the limitations on freedom of speech on college campuses. Although there are beliefs that people can say whatever they want, especially in higher education, we recognize that institutions create these limitations to prevent things such as hateful words, libel, slander and so on. Overall, we understand that every word said can not be justified with freedom of expression. Because of this understanding, The Campanil also acknowledges the rules and regulations placed by colleges and universities that limits this freedom of speech. At Mills, we know the importance to adhering to its policies in its “Student Handbook.” The “Student Handbook” even has community standards and an honor code, acting as both a guide and a contractual agreement for students to follow. In short, the handbook is to enforce and attempt to create a safe space for students to receive an education at Mills, even with our newspaper. We know the significance and impact of our words with The Campanil. We acknowledge our responsibility to cover events, especially in adherence to its mission statement: to serve the Mills community through responsible and ethical journalism. As students, we also know that freedom of speech comes with a responsibility, one that can easily be misinterpreted and misrepresented to hurt others and show one perspective. At Mills, we work to create safe, all-inclusive spaces, and we contribute to that with our newspaper.